Our very latest design, an evolution of the Mk3, now representing the best low loader you can buy. These will fit onto all standard Thorn forks with low loader bosses. They SHOULD also fit onto any other forks with the industry standard 165mm between top & lower fork bosses. Please CHECK your own bike first. We believe that our Thorn carriers are the strongest carriers on the market. They are not particularly heavy and they are very reliable…they have been used in extreme conditions, with massive weights and nobody has broken one yet! Our carriers are also very functional. Our carriers are made from 10mm seamless, cold drawn, heat treated, aerospace Cr-Mo steel. It is difficult to cold draw such small diameter tubing consequently; a dead straight tube is a rare beast. We have our tubes heat treated; this makes a significant difference to the UTS (Ultimate Tensile Strength) of the tube but heat treating such small diameter tubes, dramatically decreases the chances of making a dead straight tube. It is fair to assume that the tubes used in our carriers won’t be straight and that they will need some tweaking to fit the bosses. Our mechanics are used to this and you need not worry, if you buy your Thorn bike with the carriers fitted. If you buy carriers separately, you will need to be prepared to do this tweaking yourself. We’d love to make beautiful, straight, strong, reliable, lightweight, functional carriers but we can’t. But we are happy and proud to be able to supply strong, reliable, functional, affordable carriers at a sensible weight. Max dynamic loads, when used on surfaced roads:- When fitted with M6 screws = 18Kg per side…when fitted with 5mm screws = 12Kg per side, NOTE>> These figures should be halved when being used on South American Ripio. Dimensions: Overall height 305mm, top rail width 215mm (of which 180mm is useable). Weight 560g. Used it for 7 years. Most of te time in Denmark. Also at wintertime. It works super nice. No problems on trips across US, Europe and Australia. Even with two Salsa Anything Cages mounted on the same fork! Awesome. I only needed two extra thick washers on the lower screws, because the fork is rather thick as well. Looks good, and feels very solid and strong. A good strong rack, well designed and well made. A bit of a fiddle to fit initially but too much of a problem when you get started. The effort is worth it. Front panniers are held solidly in place without any movement of the rack. Is there a prop stand that works with this rack? 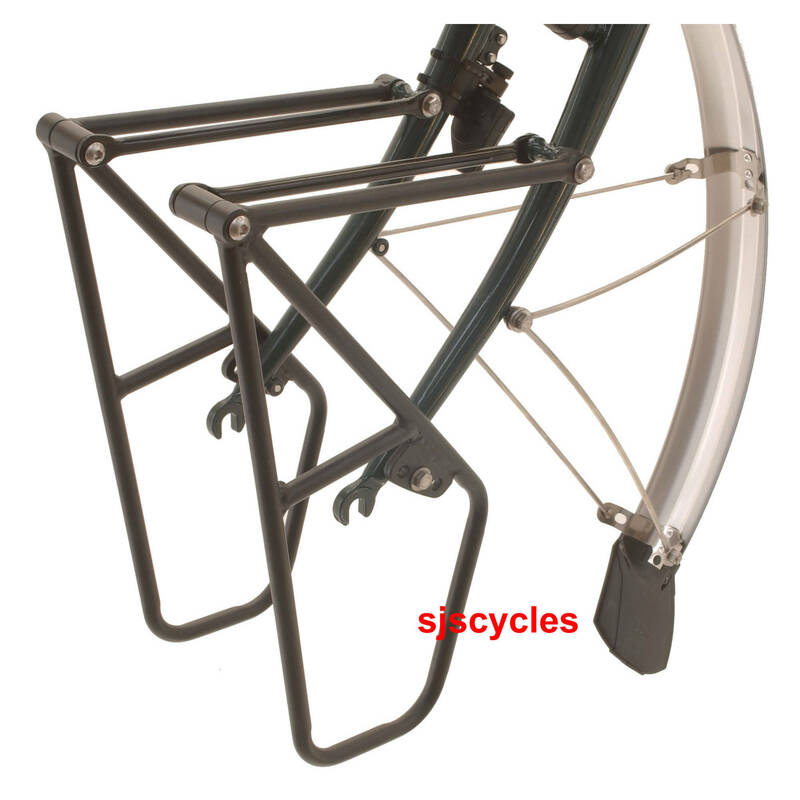 Hello, I was wondering if a low rider kickstand exists for this rack? With our tandems fully loaded it would be much more stable to have 2 points of stabilisation with a rear and front kickstand. Thank you. Thank you for your enquiry, we've spoken to our Thorn team & they are not aware of any stand available that could be fitted to their low rider rack & it is not something that they have tried as yet. can you tell me if the thorn MkV can be fitted with disc brakes? Yes, depending on the fork and disc brake caliper. Can you tell me if the Thorn MkV Lo-Loader can mount and sit level on Surly LHT forks? Thanks. Will this interfere with the front mudguards? Will I still be able to fit this to the front fork, without it interfering with my SKS Chromoplastic 700c mudguards? It depends how many bosses you have, in an ideal world you would not double up, but you could. You could also attach the mudguard stay to the lowrider, or to the fork using a P-clip. Will This Work On A Mt Tura Fork? Is this a bolt on rack for the Mt Tura fork? The front low loader will mount onto the Mt Tura fork absolutely fine.